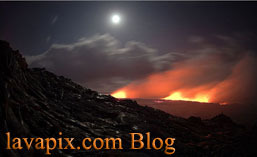 New video of the explosive lava flow ocean entry at Kilauea volcano Hawaii Volcanoes National Park. Photos will follow at a later date. Lava Fire Hose at the Kamokuna ocean entry. 61g lava flow. There’s been a significant lava Fire Hose coming out of the sea cliff ever since the bench/delta collapsed New Years Eve. If you’ve been reading my warnings at the end of the descriptions, you know this comes as no surprise. The sea cliff blocking the view of it is ready to fall soon. Later in the video after sunrise you can see the large cracks in it that run deep into the depths of the ocean. In this video you’ll see a dozen or more people at the cliffs edge. This coast line will continue to collapse. Don’t go where they are!! The Fire Hose is estimated to be about 90′ high and several feet round. Stay away from this sea cliff!!!!! The people there are lucky to be alive. Nothing brave about being out there. Nothing great to see as the steam blocks their view. That area is set to collapse at any time. Not to mention the large hot rocks flying all over that could have killed them. This isn’t one of those times when its safe to be at an ocean entry. Stay in the clearly marked safe zone. I have 26 years of experience and I know what I’m doing out there. Having said my usual warning, let me add that this flow is accessible via hikes of at least 8-9 miles round trip. There’s a real nice surface flow nearing the coast too. Also, its best not to breath if you find yourself engulfed in the steam plume. If you think you will be in it often, be sure to wear a respirator or at the very least cover your mouth and nose with a shirt or similar when breathing. I’ve been busy hiking and have had little time to post anything. I never find a way to catch up on my images. This post is about my last two visits to the volcano. Remember, I post shots from various angles for publishers. A few from these outings might be added to my Fine Art gallery. The first was to the park its self and some images of Halemaumau’s glow before and during sunrise. The lack of trade winds meant there would be calm conditions allowing the plume to rise straight up into the night sky. I also stopped along the highway to get a few shots from a distance. The glow was very bright and easy to see for miles. After a nice pre dawn session I ventured to other areas of the park to take advantage of the light winds and beautiful skies. I did shoot Thurston lava tube too which was nice and dry for once. I know the images are posted at a small on my website. Having about ten thousand images on their its necessary to keep them small so the site loads quickly. The detail in the images from my Nikon D800 is amazing. If you’re a publisher looking to license any of them, you won’t be disappointed. They’re meant to print at large sizes. The other gallery is small but, it does have some interesting images from a recent hike to the lava flows just east of the park. I can’t post everything I shot right now or even say why not. They will have to wait until some time early next year. Lets just say it was a great experience. For the most part the weather was nasty with strong trade winds and frequent showers. We did get a nice though a bit muted lunar rainbow and then a nice morning rainbow. The lunar one was muted as it was only a crescent moon which I was surprised to see it produce even that. Had it been a full moon one, a spectacular image could have been captured. As it was, my only opportunity wasn’t successful due to the strong winds. The lava flow activity was very subdued. So, much so that the flow wasn’t really seen until we were right there. I have many other images to post if I ever find the time from other parts of the Big Island. And then there’s the video footage I always talk about too…..
All content is copyright protected ©Bryan Lowry/lavapix.com. Use without my permission is prohibited. All rights reserved. Okay. I guess I could have used a more original title for this post or maybe said it in French to make it look more interesting. I decided to do this post after getting a response to a forum post I made. It’s not the first time I’ve heard this. Inadvertently the person brought up something that I may have overlooked. How they and the casual visitor views my website and blog. They said that I have way too many similar images of the lava flows and in particular used the 3-06-11 Kamoamoa Fissure eruption as an example. Which was perfect since that’s what I used to explain Why. My adventures at the lava flows are now into their third decade. Basically along with my attempts at fine art photography I have documented the lava flow activity at Kilauea volcano too. Take notice of my folders, galleries and images file names. All are by date other than very old slide shots and galleries prior to 2008. Those are separated by types of flows and or locations but, most have the date as the files name. While these images might seem repetitious they do tell an ongoing story of Kilauea’s activity. My site brings in many types of followers and all are equally important. There are the ones that simply find the images to be beautiful. Then there are the ones who are fascinated by the volcano. There are also the professionals like scientists and educators IE; professors. The latter ones appreciate the extensive coverage as many times what might be a simple outing at an eruption site to most, to them there are very important events being captured. Minute by minute sequences tell a much-needed story. So, I do have quite a story to tell. For now my photos do it. Someday I will in text. When I’ve made a very long and difficult hike to an eruption area and I’m there for 6,8, 10 or more hours, most times 5-10 photos aren’t going to cover what I’m experiencing. To the general observer its plenty but, to the scientist that’s tracking Kilauea’s activity minute by minute observations mean a lot. So, if images from the 1990’s look much like images from 2012, it’s because in general the flows do look similar. But, the time and date tell an ongoing story of Kilauea’s growth. My website content can be broken down into a few categories starting from the smaller percentage to the larger. Fine Art, stock for licensing and documentation. Not to say that I don’t on occasion post a few too many similar shots. Its tough at times to cut some shots I get. Had I listened to others and removed some I would have missed out on great licensing deals. You just never know what a publisher is looking for. I also shoot sequences of small breakouts when nothing much is going on. They tell a short story. Most of you probably already understood my websites content but, to the casual observer it probably wasn’t so obvious. Thus the reason for this blog post. Now to my infamous “Don’t try to do what I do” warning. With a twist. Never ever use the word idiot on your blog posts unless you can handle the possible negative feedback. It can be brutal and extreme. I have years of training from many past foot in mouth comments. I can handle it. Don’t put yourself in this situation. It’s no place for the inexperienced!! The learning curve is brutal!! I’m definitely interested to hear your comments on this blog post. Many times I can’t publicly display them due to the nature but, if you keep it child friendly I can make them public.